Bone shards identified as that of Crown Prince Alexei and Grand Duchess Maria ending century-long mystery of the whereabouts of the heirs to the Russian czar. "It was 99.9 percent clear they had all been killed; now with these shards, it's 100 percent," said Nadia Kizenko, a Russian scholar at the University at Albany, State University of New York. "Those who regret this news will be those who liked the royal pretender myth." 1) Shards? How many shards? Too many to survive without? If a leg is injured, you can amputate the leg, but go on living. 2) At best, we really only know that the two heirs died and their remains ended up in the same forest where their parents died. Right? How does this end the mystery? Or at least, how does this end the myth? It’s not difficult to find news stories lamenting the decline of letter writing. The main culprit almost always seems to be email. Personally, I find this laying of blame a good example of post hoc propter hoc fallacy. That’s Latin for, “after this because of this.” People notice the decline of letter writing, look around for something that has happened recently to blame it on, and email appears to be a likely scapegoat. But I look at the things I send and receive most often via email, and they’re not the things I think prior generations put into letters. Jokes. Arrangements to meet for lunch somewhere. Yes, photographs that would have been enclosed in letters get sent via email. But I think the real culprit is the telephone, and in some instances, email is bringing back the art of letter writing, not causing its decline. Yes, the telephone has been with us since the early 1900s. But long distance phone service was expensive until recently. My mother was recently telling me that the daughter of one of her aunts who lived in El Paso, TX was an early Bell Telephone employee, and was able to call long distance for free…and did, regularly. She also sent my mother a few letters over the years, but I am sure if she couldn’t call long distance for free, she might have sent more. And today many have calling plans allowing unlimited long distance. Email can be just as easy as picking up the phone, though, and the other person doesn’t have to be on the other end in order to send the message. And email can be saved, either digitally, or printed out. It is true, a lot of people delete all their email. But it is also true that in the past a lot of people disposed of the letters they received. I’ve heard some complain that the handwritten letter has disappeared, but the nail in that coffin was the typewriter, not the computer. Most of the letters I have that were written by my maternal grandmother were typed, and she passed away in 1951. They do have her signature, but that is the only thing handwritten. I am thrilled to have the letters I do, and it doesn’t matter to me that they aren’t handwritten. Actually, I am kind of happy they aren’t because typed letters are easier to read. The biggest problem is that your descendants aren’t going to find a stack of your emails in a box in your attic after you die unless you do print them out, or provide instructions on where to find them on your computer. So it's not a bad idea to let your children or a close relative know your passwords. Sunday afternoon I participated in the April Scanfest. I scanned five or six letters written to and from my maternal grandparents and their supervisors while they were employed at the post office. 1) There was the letter in 1933 from my grandfather to the Chief Postal Inspector in Washington DC, accepting a promotion and a position in St. Louis. He also requested the spelling of his name changed from Deutsch to the way it was pronounced Dyche. I don't have the response, so I don't know whether the request was denied, or my grandfather changed his mind. However, when I showed my mom the letter, she expressed gratitude that it never happened. 2) There was a letter from the Chief Postal Inspector in December of 1936 congratulating my grandfather on his recovery from an attack of appendicitis, as well as congratulating him on his engagement to my grandmother. I don't have the letter that my grandfather sent informing him of both of these events. 3) There was also a letter congratulating my grandparents in January of 1937 on their marriage, and a letter from my grandfather requesting vacation. 4) I also have a letter from my grandmother in 1944 resigning from a war-time position in St. Louis, as she wished to join her husband who was now stationed in the states in Florida. Her war-time employment in the Post Office was not part of her Personnel File which I received from the archives. I am rerequesting it under her married name as I suspect that somehow the two files were kept separate. I find it hard to believe that when she applied for the position she didn't make it clear that she had worked for the post office for sixteen years between 1920 and 1936, and if she had, I don't know why her employment between 1942-1944 wouldn't have shown up with her earlier records. But perhaps "it's the government" is simple explanation enough. I should note that none of the letters from my grandparents are signed copies. I have no evidence they were sent as typed. They could have retyped something else and sent it, and kept the first draft. I don't know why they would have done that, but they could have. I also scanned about 30 photographs. Here are two of my favorites from the bunch. An oldtime postcard. 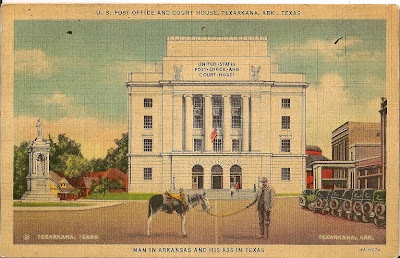 Nothing was written on the postcard, so it appears it was in my grandfather's collection for the humor, and for its relationship to his postal employment. 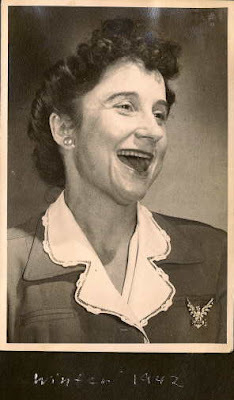 And an excellent photograph of my grandmother laughing. It's unknown what she was laughing at. Trying to trace your ancestry back to William the Conqueror, Jesus, or Confucius is sort of like a chicken trying to prove it's descended from a T-Rex. Apparently, The chicken is, though. Do the Missouri Sanborn Maps tell me where my great-grandfather went to school? Thanks to the Missouri State Genealogical Association blog I learned that the Missouri Sanborn Maps are online. If one isn't sure about street name changes, or renumbering, the Sanborn maps can help you plot where an address is on a current map by pointing out cross streets and other landmarks that don't change with time, such as parks. You can also find out what else was in the neighborhood, such as businesses, schools, or houses of worship. The Missouri Sanborn maps online for St. Louis city are mostly from 1909. All four of my paternal second-great grandfathers were in St. Louis in 1909 - Selig Feinstein, Moshe Leyb Cruvant, Morris Blatt, and Samuel Newmark. They all moved around a bit as well, and when I added in some work addresses I had, there were a lot of addresses I could look up. From the city directories I knew that from 1896 to 1906 the Feinsteins were at 1122 North 8th. My great-grandfather, Herman Feinstein, was age 10-20 during those years. I think I have a good idea where my great grandfather probably went to school. The map above is from 1909, so there is no guarantee that the school behind where my great grandfather grew up was there for the decade prior. The cross street at the top of the map is Biddle, and the Cruvant family lived at 701 Biddle briefly during 1897. 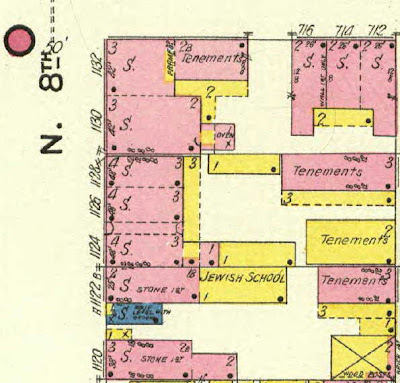 The Blatts lived in the 1000 block in 1896. So the three families weren't too far apart during those years. There are several logical sentences in that paragraph, though only one period at the end. Melvin will often not use upper case letters to start a sentence. Usually it is possible to tell where one thought ends and another begins, but there are times where there is some confusion. The 'and' written vertically is very common in his letters, and I've seen it in one of his granddaughter's letters to my mother as well. I don't know where he learned it as I have been unable to find references to it online. For conserving space the traditional ampersand is much easier to use, especially the version that resembles a plus-sign. I lean towards adding the capitalization and creating the sentence breaks, where I feel they should be, especially since I am putting links to the images next to the transcription on the family website, and as I've mentioned before, it utilizes wiki software, so if anyone in the future feels I've transcribed it incorrectly, they can make the necessary changes. However, I have come up with a shorthand method of indicating the vertical 'and' so I can differentiate between that usage, and when he will occasionally write it 'normally'. I've been using &d, but the frequency of its appearance makes it quite noticeable. I've been maintaining spelling errors, even the ones that make me cringe. My general feeling is that if someone wants to see exactly how it was written, the original scans will be there, but the transcription is to convey the content so that it is easily readable, while also maintaining as much of the writing style, and it's that balance which is troubling me. I always thought that genealogy was for people whose blood ran blue. It was for folks who traced their ancestry to the Mayflower or the American Revolution, not those who came over in steerage one step ahead of the Cossacks. Ellen Goodman writes a good column for the International Herald Tribune on some research she had done by the NEHGS, and what she learned. There are other bits of paper in my genealogical binder. It's moving to see the name of the actual ship that brought my family to America and the naturalization papers that required them to "renounce forever all allegiance and fidelity" to the Russian czar, which they must have done with pleasure. But what we really want from the generations past are not just the facts or the DNA. We want the stories. Love, passion, success, disappointment, humanity. There may be no way to know - really know - their interior life. But how many of us would trade in the data for one good diary? Will we remember that in our own "estate planning"? The 46th Carnival of Genealogy has been posted, everyone writing about their family traits. I noticed a few that dealt with diseases that run in the family. I'd considered mentioning again the colon cancer that I'd blogged about back in January, but decided to focus on happier traits. Though the message of getting yourself tested if you know there is a family history is one that can bear repetition. The topic for the next edition of the Carnival of Genealogy is: A Place Called Home. It's time for a geography lesson. Pick out a city/town/village where one of your ancestors once lived and tell us all about it. When was it founded? What is it known for? Has it prospered or declined over the years? Have you ever visited it or lived there? To a certain extent, we are all influenced by the environment we live in. How was your ancestor influenced by the area where they lived? Take us on a trip to the place your ancestor called home. The deadline for submissions is May 1, 2008. As others have pointed out, April is National Poetry Month. I haven't done much to celebrate it here. I've posted a lot of poetry here in the past. And I've been posting a poem on my personal blog every day so far this month. And here's an audio recording of Walt Whitman reading his poetry with a slideshow of photos of Whitman. Sam was the brother of my grandmother, Myrtle Van Every Deutsch. We (me, my mother, and her sister) didn't know too much about him. Family notes passed down said he was an optometrist who married a woman named Esther Dahlin, had a son named Everett who drowned at age 17, and Sam died in Kansas City, MO from a flu epidemic. That was the extent of knowledge with no documentation to back it up when I began my research a year ago. I found him in the census records easily enough. In 1910, he was living in a lodging house, a streetcar conductor in San Francisco. No dependents. In 1920 he was a Route Agent for a newspaper, still a single lodger with no dependents, but now living in Oakland. No question it was him, as the middle initial matched, and the birth place for himself (Texas) and his parents (Texas and Michigan) were correct. In 1930 he was finally an optometrist in Kansas City with a wife named Myrtle. The census said she was his first wife, and they were married in 1927. With my grandmother's given name, I was suspicious, but the birthplaces of this Myrtle, and her parents, did not match my grandmother's data. My suspicion then, and still is, that the Myrtle on the census was made up. The census taker asked Sam if he was married, and he decided to say Yes, and gave him the name of his sister, along with some random states for place of birth for her and her parents. Maybe he'd been drinking when he answered the door. The rest of his family (except my grandmother) remained in Texas, and later, his father moved to New Mexico. His father states in a letter to my grandmother, that the letters from Samuel were few and far between. Did the rest of the family know about his wife Esther and son Everett through his letters? While the tragic loss of a son could understandably propel someone to alcohol problems, I began to question the existence of his wife and child. Searches on the name Esther Dahlin brought up some possibilities, but no marriage records. Searches on Esther Van Every brought up nothing. There were two Everett Van Everys on Ancestry, but with different parents. Of course, this raised some more questions. What was Samuel doing in San Francisco and Oakland in 1910 and 1920? He also shows up for the first time in the St. Louis city directories in 1922, two years prior to Everett's death in Austin. Some research turned up the Dahlin family living in Austin, Travis TX in 1910. Parents Andrew and Lonie,2 a daughter named Alma, another daughter named "Van Every" (no first name, but it's probably Esther). And young Everet Varleny. (Darn indexer.) I should have seen this record before, but there are enough Van Everys that I don't look at the record of each I find in a search. I'm usually looking for specific given names. I haven't found Esther and Everett in 1920 yet. But it appears shortly after Everett was born, something happened in the relationship between Esther and Samuel, and Esther kept the child. I'm going to try to find young Everett's obituary. And I apologize to Uncle Sam for thinking his wife and child could be fictional. 1) I've written down that Everett was born in 1906. Sixes that look like eights aren't uncommon, and Aug 1908 - Apr 1924 is only 15 years. 2) The actual spelling of Esther's parents names seem to be Andrew and Lovisa. There's a very nice paragraph on Andrew and Lovisa from a 1918 book entitled "Swedes in Texas", along with a photograph. For several years now I've used very few stamps. All my bills are paid either through direct deposit, or an electronic check. I don't send letters, I send emails, or pick up the phone. However, that's changed in the past year. There's the letters I'm sending to distant kin, to county clerks, etc. Blair, a (non-genea)blogger, mentions that the price of stamps is going up again on May 12. Somehow I had missed the announcement. He also reminds that you can purchase as many forever stamps as you want, before May 12, at the current prices, and they will be good, forever. (At least theoretically. The US Post Office could always go back on their word.) I realize that Forever Stamps are a year old and all, but as I said, I haven't been using stamps much until lately. A couple months ago I had a lot of fun with MyHeritage's Face Recognition software, trying to see which members of my family looked more/less like their parents and grandparents. I was reminded of this by the topic for the latest Genealogy Carnival: traits. Physical traits are the easiest to see. Hair color, eye color, the size of one's ears, the shape of the nose, amount of body hair. When young my hair color was blonde, almost white, unlike either my mother or father. However, the children of my mother's sister all had similar hair color, as did my aunt. So there was probably a recessive blonde gene from my mother that combined with a recessive blonde gene from my father. However, over the years, my hair has grown darker, and most people would say it is now brown, and whether it turns grey, or disappears first is a race that should be interesting to watch. Though the non-physical traits in some ways are more interesting to me. Where does my interest in religion come from? My mother's tree has been traced back the furthest with ancestors in the US as early as the 1600s. I have several Reverends for direct ancestors. My maternal great-grandfather, Melvin Van Every, was clearly very passionate about religion from letters he wrote to my grandmother. I don't know of any Rabbis in my family tree, but my paternal great-great grandmother, Minnie Mosjabovsky Cruvant's tombstone says she was the daughter of a "Tzaddik" (a righteous/learned man.) My mother has a first cousin, and my father has a second cousin, who both converted to Catholicism and became a nun. So while the particulars may vary, there seems to be an overabundance of individuals who are passionate about their beliefs in my family tree. (This can be seen also by several members who are passionate about their secular beliefs, which isn't all that different.) The one thing my family doesn't have a lot of is ambivalence. We all have opinions, and we aren't scared to share them. Kathi at AncestorSearchBlog uses Google Trends to compare the 2004-2008 trend history for those searching for the word 'genealogy' compared to other hobbies such as gardening and scrapbooking, and other interests such as politics and religion. It's an interesting comparison. My biggest initial surprise was the graph for religion, for while it remained fairly consistent, it was clearly seasonal, dropping drastically every year at the end of December. The suggestion that people lost interest in religion at the end of December was fairly disconcerting, until I factored in the drop during the summer as well. That's not because there are no religious holidays in the summer, my initial suspicion. A large number of people who use google, go on vacation every summer and at the end of December. (And during that period of time, when they're on computers, they're searching for other things.) You can see a similar effect with the graph for politics, though there is an unexplainable spike in November every two years. However, I decided there were a few more genealogy related graphs I was curious about. And my investigation led to additional queries. 1) I wondered how many people searched for "Genealogy" but didn't know how to spell the word correctly. I was also curious about other key words/phrases such as ancestry, family history, and family tree. It turned out that back in 2004, 'genealogy' was the #1 searched for phrase out of this group, but in 2008 'family tree' has surpassed it. The other three are less frequent searches in comparison, but I did note that it appeared that in 2004 'geneology' was more popular than 'ancestry'. In the past 4 years there has either been an increase in spelling skill, or perhaps the popularity of a particular website has influenced the results (by a tiny factor). Since everything is relative in Google Trends, I decided to look at this comparison in greater detail by focusing just on these two terms. The search frequency for 'geneology' and 'ancestry' became neck and neck at the beginning of 2006, and 'ancestry' surprassed 'geneology' in 2007. But one of the interesting features of Google Trends is that while the default gives you the results for the entire world, you can narrow it down geographically. Here's the same comparison above, but just for the US. As you can see, there are similarities, but 'geneology' is definitely more popular in the US than elsewhere in the world. What this says about our schools is up to you. Google Trends allows you to get even more geographically narrow minded. I was satisfied with just the US for the comparison above, so for the next chart I decided just to see the general trend for 'genealogy' in my home state. The graph was indeed extremely worrisome. Prior to about March or April of 2007 there was basically no interest in Genealogy in the state of Missouri. And then there was a dramatic spike. This corresponds with my genealogical research. Coincidence? Could this just be me? I decided we needed more information. Little Billy then goes to his father, and asks him the same question. Confused, Billy returns to his mother and tells her what his father said. If ever there was a tangled web, this was it. I got lost just looking at one line of it, but sure enough, it did go back to what someone has entered as "Joseph, father of Jesus" and "Mary the Virgin." This genealogy showed only one child of that union: Joseph Arimathea. Jesus was not mentioned, but perhaps the compiler of this lineage thought that went without saying. This compiler did give a date of birth for Joseph as the year 100 in Bethlehem. The date alone makes the relationship questionable: How could Jesus have a brother born 100 years after he was? I am not a scholar of the Bible, but this was the first time I had seen Joseph Arimathea linked as the son of Joseph and Mary, although some have speculated that he might have been related to Jesus. According to medieval legend, Joseph took the Holy Grail containing the blood of Jesus to England. Terry at Hill Country and Blaine at The Genetic Genealogist mention the US Government's plans to go low-tech with the census count in 2010. Related, I've seen a few bloggers over the past few months discussing what will be asked in the census, with the fear we are headed to shorter census forms, with less information on them. There's also a fear we might go to statistical sampling, and thus not get a complete count. Valid concerns for genealogists. But how bad would it really be if we completely lost the census as a research tool starting, let's say, with the 2010 or 2020 census? I've been giving this some thought. Certainly, when I am researching ancestors from the late 19th and early 20th centuries, the online census forms have been a godsend. So, one can extrapolate, in 100 years the future generations will find the census forms I am on a godsend, too, right? I'm not so sure. Records on people prior to 1900, and in the early part of the 20th century are sparse. That's a lot of the reason we love the census. In some cases, it's all we've got. But it's not like relatives are untraceable after 1930. Record keeping starts to improve greatly in the 20th century. Vital Records are going online. In 2082, 72 years after 2010, when the 2010 census is released, I'd be surprised if there was much information on it that wasn't obtainable easily somewhere else. Maybe genealogists will welcome it as a verification of what they have learned elsewhere. Or maybe we will enjoy reading what our ancestors "said" as opposed to what we we already know. Back when there was discussion about the "Mother of all Genealogy Databases" I had doubts that such a concept would ever exist because the logic it takes to connect "John Smith 1" with "John Smith 2" will be too complex for computers. Especially with the data available prior to the computer age. However, with the 2010 census, we're talking about data available now. I can easily envision a government database where one enters the social security number of a deceased individual, and retrieves a display of public information. This display could be just about anything the government knows about that individual not deemed private information. If you're not sure of the SS#, you will naturally be able to look it up like you are now. Sure, lots of our ancestors don't have Social Security numbers, but if we were born in the US, we all do now. (And legal immigrants get id#s too.) This database isn't available now, and probably isn't possible now, but by 2082? I haven't been doing this very long, but the greatest part of the census seems to be the family groupings allowing you to trace a family back. But recently Ancestry.com uploaded the IRS records from the 1860s and 70s, with a handful of later ones as well. I've never had to list dependents on a tax form, alas, but I believe when one does, one names them. With the Texas marriage and birth records available at Ancestry I was able to find distant cousins born within the past ten years. By 2082 I expect the birth information of everyone reading this will be as easily available to their descendants. However, while the future is always difficult to predict, I suspect the census won't be as useful a tool for genealogists of the future as it is today. Back on March 17th I joked about my great-grandfather Barney growing up in a suburb of Dublin, Ireland, known as Warsaw. A few minutes ago someone left a comment on that post that yielded an interesting discovery. The commenter had a grandfather who insisted the family came from Scotland. It turned out his family came from Schotland, a suburb of Danzig (Gdansk) Poland. My great-grandfather didn't merely say the family was 'from' Dublin, Ireland but claimed to have attended school there. So this possibility of generational geographical confusion isn't enough to explain away his fibbing. However, it might provide an interesting source for the idea of the fib. So I started looking through towns of Poland just for kicks. And I discovered: Deblin, Poland, just over 100km from Warsaw. I will certainly have to keep this possibility in mind. Here's the post I promised awhile back on the Technology themed Carnival of Genealogy. You want a genealogy wiki. What are your options? As I see it, there are two basic options. Option One: Find a public "Genealogy Wiki"
Is there a "One World Tree"-type website, but in wiki format? There is at least one: FamilyPedia, which is on Wikia. Wikia is a product of the same company that is responsible for WikiPedia. Basically anyone can create a Wiki about anything on Wikia, and someone's already created one for genealogy, so there's no real reason to recreate the wheel. However - I see serious problems with using a public Wiki for family genealogy. I've seen some of the gross errors in Ancestry's "One World Tree", and I suspect there will be a lot of fighting ultimately between different users over ancestors, as one tells another that they have the wrong "John Smith" married to the wrong "Jane Green"
There is an "Alternate Surname" of "Newmack" on Ancestry for a local relative in a census. That means someone researching a relative with the "Newmack" surname found my family, and decided they were their family, and decided to be "helpful." On a Wiki I certainly could tell them "hey, sorry, you're wrong" and change it back. But what if they don't think they're wrong, and a fight ensues? Who's going to resolve these disputes to the satisfaction of both sides? Option Two: install a wiki on a private website. Wait! I don't understand those words! PHP is a computer programming language. MySQL is a type of database. You don't have to know anything about either, as there are pre-written applications that you can install without knowing the languages themselves. Every host that provides space for websites will have a list of features that they are able to provide. (Or at least every professionally run one will.) So you will only need to look through the list of features for the words "PHP" and "MySQL". you will likely find yourself coming back to it. You might not have a problem with anyone seeing the information on your website. However, wiki software allows anyone to modify the information. And while there aren’t going to be a lot of people interested in vandalizing your family history, there are computer-programs scouring the web looking for wiki pages to turn into spam. Think about the emails you receive. If it’s not password protected, you will have to spend some of your time fighting spam. If it is password protected, you will be spending zero time doing this. Password protection also allows you to put “family only” stuff on the site you might not otherwise. To achieve #1 and #2 you are going to need to pay a host, but prices have come down from where they once were. There are a lot of hosts to choose from. I am only going to mention two that I have personal experience with, and feel I can recommend. While some of the figures look different for these two, for 90% of all people, they are the same. You probably know how many gb of space your computer holds. 1000 may be double 500, but both are probably more than you’re going to need. I am currently using about 3 gb of space to host six websites, including two family-wikis, A research site for a 19th century French author, and a literary magazine. One thing you may notice is that it is possible to host more than one domain (www.yourname.com) on one account. It might be possible to find somebody (or multiple somebodies) to split the cost of the account. In that case, Hostrocket’s limit on MySQL databases and on domains might make a difference in favor of Dreamhost at some point. The domain names themselves cost about $10/year at godaddy.com. Many hosts will have something they call ‘one-click installs’ or something similar, where they have a list of programs that can be installed almost with the click of a button into your account. This list can vary. Both Hostrocket and Dreamhost do have wiki-software in their one-click install list. However, there’s a difference. Dreamhost has MediaWiki (and PhpGEDView - a popular genealogy app) on their one-click installs. So if the website is going to have a Wiki as one of its requirements, Dreamhost is slightly favorable between these two options, and it is where both of my family wikis are currently hosted. I have never attempted to install MediaWiki manually, so I am unable to give any advice on that, though the instructions are online. Let me know in the comments if there are other aspects about maintaining a Family Wiki that you are interested in. I have nothing against Lolcats, but there are two types of families with family pets. There are cat families, and there are dog families. (And then there are the rare families where cats and dogs have learned to live in peace together, and it is the owners of these pets we should be appointing as diplomats to foreign nations...but that's an argument for another post.) Anyway, my family has always been a dog family. I am also going to violate another tradition of Lolcatdom, and the text in this picture isn't coming from the dog's mouth. It's coming from the invisible kid, but it's in the invisible kid's real handwriting, and real words, written down 34 years ago, and scanned in from a scrapbook tonight. 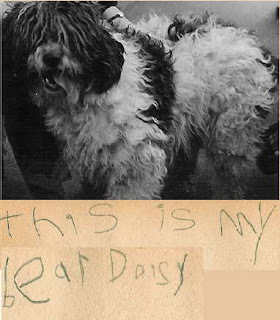 Elsewhere in the scrapbook the kid mentions Daisy as a dog, so the kid probably wasn't confused. This is likely his first known recorded usage of a metaphor (age 5). And as April is National Poetry Month, it seems appropriate. Yes, the invisible kid is me. Daisy was half Springer Spaniel, half Poodle, and probably the most intelligent dog I've ever known. All the dogs I've known have had their own special qualities, but Daisy cornered the market on intelligence. She even taught herself, without any assistance, how to ring the doorbell to indicate she wanted to come inside. And she certainly had a foolish appearance at times - as illustrated in the photo - which makes it even more appropriate for today.